At long last I have a skin care tutorial & video! This is going to be about my DIY Body Butter Bars, I LOVE these gems! They are excellent for the winter months when the weather is cold and dry resulting in dry and sensitive skin. I have 2 different recipes my CoSheaCo Bars (I add some exfoliating ingredients to make a few exfoliating Body Bars) and my Simple CocoaCo Bars which only consists of 2 ingredients. What are Body Butter Bars? Literally they are bars made up of oils and melted butters to help moisturize and seal in moisture. You can add additional ingredients to make them super moisturizing e.g. glycerin/honey/agave nectar or coffee beans/dried roses/dried lavender/sea salt etc to make them exfoliating Body Butter Bars. They can be used in place of lotions or creams after a shower or bath. 1. I slowly melt the butters using a double broiler in a heat proof glass bowl. 2. I take the melted butters off the heat and add the Virgin Coconut Oil. 3. I add the other ingredients (e.g. 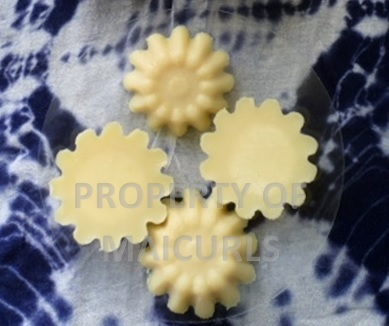 Glycerin, Coffee infused oil and Essential oil in the CoSheaCo bars) once I know the butters are not really warm. 4. 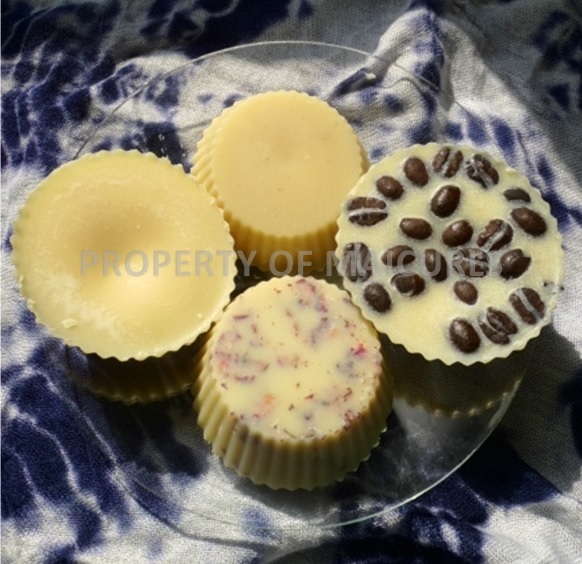 If you are making exfoliating bars put your chosen ingredients (coffee beans and rose petals) in the molds and then pour the melted butters and oils into the mold. 5. I let the mixture sit on a counter for a few minutes and then place the molds in my fridge. I prefer setting mine overnight (let them set for no less than 4 – 5 hours until they are completely firm, longer if possible). 6. Once they are set, gently pull back the edges of the molds and the bars will slide out. I use silicon molds but for the purposes of this demo I also used metal molds in case you don’t have silicon ones. I always store my bars in the fridge in an airtight container. Since I do not use Beeswax in my recipe there is the potential of the bars melting in warm climates or hot households (more likely in summer) but I do not risk it so I store all but the one I will be using in the fridge*. The fridge and airtight container also helps to keep the bars from going “off” too quickly, but the general shelf life of the bars should be 6 months – 1 year since no bacteria inviting ingredients (e.g water, Aloe Vera juice etc) are used in combination with the oils and butters in the recipe. I keep the bar being used in an airtight container in a dark cupboard in my bathroom room. * There is nothing “wrong” with beeswax, it is a natural ingredient but I choose not to use it simply because it tends to sit on my skin and I do not like that feeling (I have sensitive skin). There are thousands of Body Butter Bar recipes online that follow the same ingredients I use but also include beeswax. After a shower I don’t completely dry off all the water with a towel, I then rub the bar between my dry palms and apply like I would a body cream. The bar will help trap in moisture from the water and also add amazing benefits from the butters and oils. With the exfoliating bars I rub the bar itself onto my skin to get the additional scrubbing effect. Cocoa butter – is known for its deep hydrating and moisturizing properties due to its high fatty acid content. It is said that the butter can help reduce stretch marks and the fact that Cocoa butter is packed with antioxidants, means that it can help fight off free radicals and skin irritations such as eczema and dermatitis. Coffee bean infused almond oil – is rich in vitamins A, B, D, and E, has been used to improve the skins complexion and its emollient properties soften the skin. Almond oil is quickly absorb into the skin and has healing and hydrating properties. The coffee bean infusion helps to tighten the skin giving you a youthful fresh glow, reduce the appearance of cellulite, reduce redness and skin inflammation and is known to fight free radicals thanks to the antioxidants contained in caffeine. Coconut oil (Virgin) – is very good at re-hydrating the skin because it is absorbed into the skin and conditions, moisturizes, and softens the skin. Coconut oil naturally clears away dirt, grime, and dead skin cells and due to its anti-bacterial and anti-viral properties. The oil acts as a good protectant against skin irritations and rashes. It is known to soothe insect bites, flaking skin and mildly sun damaged skin. Glycerin (Vegetable) – is a natural humectant that draws moisture onto the skin by extracting it out of the air. Apart from its ability to draw in moisture, it is also known to help retain moisture in the skin. This makes Glycerin a great agent in fighting rough, dry, irritated and dull skin. It also makes it an excellent skin plumping product. Grapefruit essential oil – aside from its delicious scent, it has antiseptic qualities and helps to clean and clear congested skin and to treat oily skin. Rose petals & Coffee beans – used as exfoliating ingredients to help remove dead skin cells and stimulating blood flow. 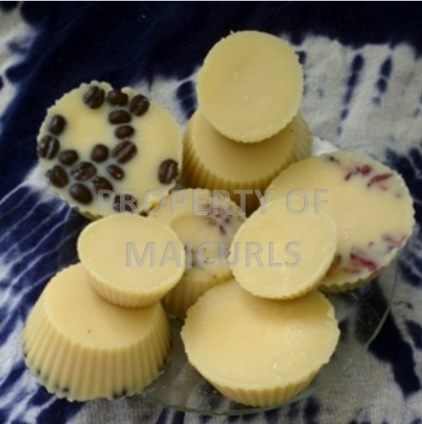 Shea butter – is highly moisturizing, improves the skin’s softness, suppleness as well as soothes burns. Shea butter can also be used as a mild “sun protectant”, soothes, moisturizes and is an effective anti-aging & anti-wrinkling butter. I have a video on my YouTube Channel (below) showing you exactly how I make both Body Butter Bars. This entry was posted in Almond Oil for skin, Body Butter Bars, Cocoa Butter, Coconut Oil for skin, Coffee bean infused oil for skin, Coffee infused oil, DIY Coffee infused oil, DIY Infused Oil for Skin, DIY Infused Oils, Glycerin for Skin, Moisturizing Skin, Organic Butters for Skin, Organic Unrefined Cocoa Butter, Organic Unrefined Shea Butter, Shea Butter, Virgin Coconut Oil and tagged Body Bars, Body Butter Bars, Cocoa Body Butter Bars, Cocoa Butter, DIY Body Body Bars, Exfoliating Body Butter Bars, Homemade Body Butter Bar, Moisturizing Body Butter Bars, Organic Unrefined Cocoa Butter, Organic Unrefined Shea Butter, Shea Body Butter Bars, Shea Butter on December 28, 2014 by Maicurls.